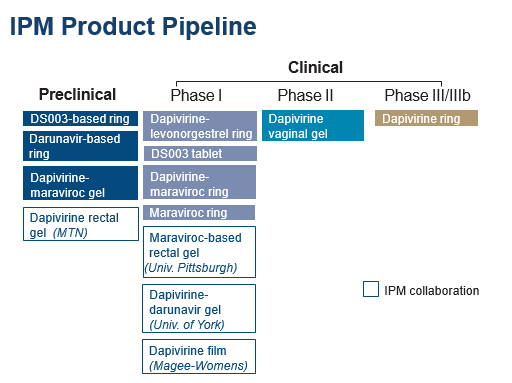 Since our inception in 2002, IPM has advanced a diverse range of HIV prevention products for women that harness a range of potent antiretrovirals (ARVs) — the same types of drugs that are used to successfully treat HIV/AIDS and prevent mother-to-child transmission in millions of people around the world. Ending the epidemic will require multiple prevention methods. A robust portfolio that includes new and combinations of drugs can help advance products with potentially higher efficacy. Because it takes more than a decade for prevention products to go through clinical trials and reach regulatory approval, research and development on additional drugs must happen now. The promising ARV compounds in IPM’s portfolio are the result of our partnerships with pharmaceutical companies. Through royalty-free licensing agreements for eight ARVs and exclusive worldwide rights for one ARV, we are able to maximize the potential of drugs that use a variety of mechanisms to act against HIV infection. These agreements also help ensure affordable access to any future products using these ARVs where women face the greatest threat of infection. Our products are summarized in the graphic below.